To start the discussion, Dr. Magen provided a brief overview of four critical challenges that the Trump administration will face in the Middle East and North Africa, explaining that the MENA region is currently in the middle of a profound crisis characterized by volatility, insecurity, increasing criminalization and state fragility. 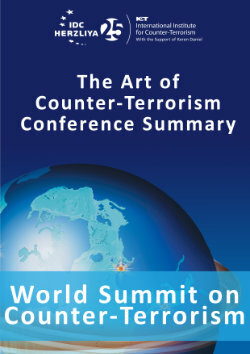 Within this framework, Dr. Magen stated that ISIS represents the major challenge for the Trump administration because not only is it “not going away", even if it is undermined both in Syria and Iraq, but also because the proliferation of fragile states and under-governed territories is providing safe heavens for ISIS in places such as Yemen, Sinai, Lybia, and some parts of Tunisia. A second important challenge identified by Dr. Magen is the growing link between terrorist activity and criminal activity. In particular, Dr. Magen argued that the flow of weapons, the open borders and the wave of immigration to Western countries has contributed to create unprecedented opportunities for terrorist organizations to make money out of criminal activity. The third main challenge concerns the migration pressure. On this point, Dr. Magen emphasized that with all the states in collapse in North Africa and Middle East “we are going to see more pressure of migration and more people on the move from Middle East and North Africa mainly into Europe but also towards the USA”. The last challenge relates to the role of Russia and Iran in Middle East affairs. In particular, Dr. Magen stressed that Iran, which he considered to be the strategic victor of the post Arab Spring period, has extend its influence into the Arabian peninsula and into many Middle East countries, with the result being that today “there are a lot of potential flash points between Iran and American allies” and “we should not exclude the possibility of some kind of escalation between Iran and United States”. Shifting the conversation towards Trump's executive order of halting all refugee admissions and temporarily barring people from seven Muslim-majority countries, Dr. Cavari argued that this extreme executive order indicates that the Trump administration — in sharp contrast with the Obama administration — is going to be in a struggle with the Muslim world in what Samuel Huntington has called “clash of civilizations”. In particular, Dr. Cavari pointed out that while Former President Obama tried to split the Muslim world into groups, tackling the violent prone groups and working with moderate groups, President Trump "has shown to not have the sensitivity to be able to look at these groups” and “he has shown he has a black-and-white vision, supporting the idea that the world is divided into Muslims and non-Muslims". Dr. Magen then shed light on the differences in thinking between Trump and Obama about the relationship between Islam and contemporary international terrorism, arguing that we have moved from one extreme to another. Where, indeed, Obama made the mistake of not addressing the relationship between certain fundamentalist violent branches of Islam and terrorism, now it seems that the pendulum has swung to a certain populist narrative “where all branches of Islam are being colored with the same color”. In this context, Dr. Magen strongly believed “we need to have a much more informed, fact-based and nuanced conversation about the relationship between Islam and contemporary international terrorism”. Mr. Diker then asked about what should be the top priority for the Trump administration in the Middle East. Dr. Magen emphasized that the main priority for the Trump administration vis-à-vis the Arab world should be, on the one hand to reassure traditional Sunni American allies that the United States will support them in this great time of volatility and uncertainty that the region is experiencing, and on the other hand to re-establish the trust among them as they are critical allies in the big struggle against Iran and its hegemonic ambitions in the Middle East. Finally, in response to Mr. Diker’s question about the current American grand strategy in the Middle East, Dr. Magen stressed that over the last eight years there has been an American attempt to withdraw from the Middle East and also Trump would appear to continue along this line. In particular, Dr. Magen believed that the Trump administration will be judged on what it does for workers in the United States and for American lower middle-class families and not on what it does in the Middle East. Therefore, the fundamental interest of the United States seems to be “not to get bogged down and re-entangled” in Middle East.